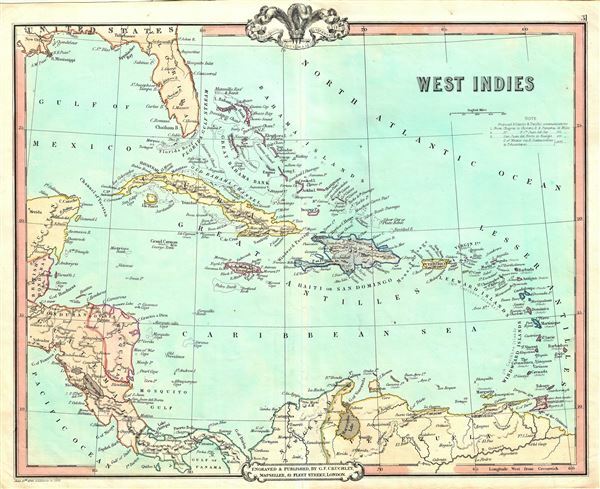 This is a beautiful 1852 map of the West Indies by George Frederick Cruchley. Centered on Haiti or San Domingo (Hispaniola), the map covers the Caribbean from Florida to Venezuela and from Yucatan to the Lesser Antilles. It includes the Bahamas, Cuba, Jamaica, Haiti and San Domingo (Hispaniola), Porto Rico, the Virgin Islands, the Leeward and Windward Islands and Trinidad and Tobago. It also shows parts of Guatemala, Venezuela, New Granada and the Isthmus of Panama. The map also marks the Mosquito Gulf or the Bay of Mosquitoes, which is a corruption of the Moskito, its indigenous tribal inhabitants. Cruchley also identifies such undersea features as the Florida Reef, Pedro Bank and the Great Bahama Bank. Various cities, towns, forts, rivers, rapids, fords, and an assortment of other topographical details are noted. The map is color coded according to territories and relief is shown by hachures. Very good. Minor wear and toning along original centerfold. Blank on verso.